Ian Cohen, ’17, was taking a risk. Not in a weighty, life-changing way — although he was just three days into Law School orientation and feeling a bit apprehensive — but in the more immediate sense. He was about to fall and, theoretically, his classmates might not catch him. But he was in a trusting, even playful, mood — and there didn’t seem to be much to lose. And so on a sunny September day, out in the woods in Chicago’s western suburbs, Cohen announced his intention (“taking a risk”), waited for a response (“go for it”), and allowed his body to spill back toward the sea of green t-shirts. Within a few hours, he’d be further outside his comfort zone than he expected. And, of course, it was. The bold initiative, which launched last fall, is also powerful, meticulously connected to real-world needs, and effective. The Law School is doing something that is unprecedented among its peers: it is investing significant resources in helping students hone the communication, self-assessment, and teamwork skills that law firm and corporate leaders have repeatedly identified as critical differentiators in a market that is more collaborative, faster-paced, and less forgiving than it was a decade ago. Built around leading research and mandatory for all new 1Ls, Kapnick is at the forefront of a movement to bring the interpersonal savvy of the business world to legal education, which at the Law School means acknowledging an inescapable shift without sacrificing the analytical gravitas of the academic program. The Breckinridge cohort negotiates an exercise where students rearrange themselves in height order on a beam without falling off. 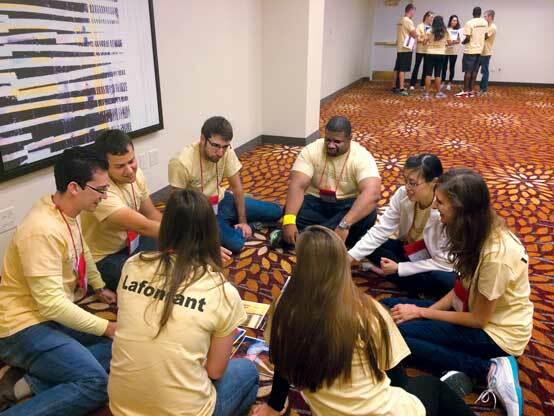 The program, a series of eight modules that run mostly during orientation, grew out of feedback from members of the Law School’s Visiting Committee and is the result of a $2 million joint gift to the Law School and Booth School of Business by Scott, JD/MBA ’85, and Kathleen Kapnick, ’84. The idea was to develop a program modeled on Booth’s well-respected experiential Leadership Effectiveness and Development (LEAD) course, which was the first of its kind when it was launched more than two decades ago. 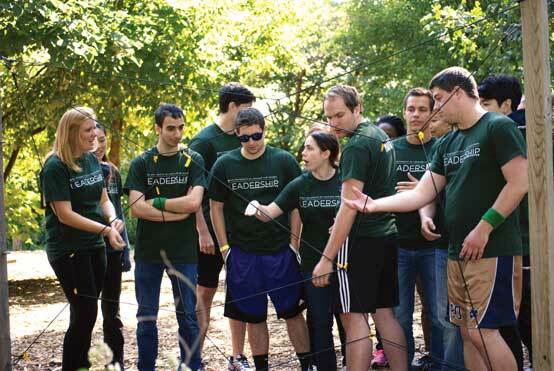 Tailored to the Law School, Kapnick is run jointly by the leadership development staff at Booth and the Law School’s Office of the Dean of Students. Following the Booth model, carefully selected student facilitators — twelve third-year law students and twelve second-year Booth students — guide new 1Ls through a series of robust workshops designed to foster self-awareness and lay the groundwork for gradually developed, but enduring, leadership skills. 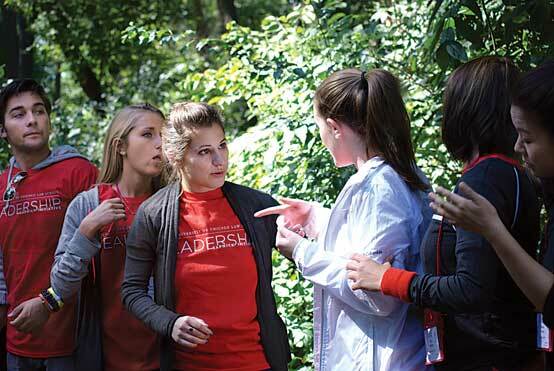 The facilitators receive intensive training the previous spring, experiencing the Kapnick modules firsthand, working with a mentor, and developing their own leadership styles. The program begins in September with a two-day retreat, during which the students visit the outdoor ropes course and participate in a variety of team-building activities that force them to acknowledge, and even reevaluate, their natural tendencies. Facilitators add unexpected obstacles — banning verbal communication just as a team is hitting its stride, for instance — and watch to see whether participants adjust and solve or fumble and stall. In classroom modules back on campus, students receive feedback on first impressions, explore how their own personality traits influence leadership style, learn to “captivate the audience” through public speaking, develop strategies for building effective and influential relationships, and examine business-relationship norms of other cultures. In one exercise, they work one-on-one with a facilitator to analyze a video of themselves participating in a group discussion — a sometimes uncomfortable, but often enlightening, process. A growth in self-understanding was one of the two most immediate and noticeable effects of Kapnick. The other was the striking bond that formed among the 1Ls. Several faculty members saw the change, too. At the retreat, part of the Lafontant cohort (cohorts are named for prominent Law School faculty or alumni) works on a task involvingselling an imaginary item of their own invention. Those open minds may well be why the Kapnick dominos continued to fall in the weeks and months after the program ended. As fall quarter progressed, the lessons settled in, perspectives continued to widen and shift, and students began to make subtle changes that hinted at the enduring legacy to come. Back at the retreat, Ian Cohen had just dropped into his teammates’ waiting arms. Not so bad. Heading into Law School, and into the Kapnick program, Cohen hadn’t known quite what to expect. He’d worried that an elite law school would invite cutthroat competition and anxious intensity. Although he’d had leadership opportunities during his undergraduate years at Cornell and on internships in a New York State assemblyman’s office and in the Kings County (NY) District Attorney’s Office, he didn’t think of himself as particularly take-charge when it came to group collaboration. He knew he had a tendency to be shy and hang back at first, and he’d always assumed that only the most assertive people excelled as leaders. But out in the woods, that began to change. After his classmates caught him, any remaining concerns about feeling silly dropped away. “We were all laughing together,” he remembered. He found himself entirely in the moment, focused on the task at hand. The fall was part of a more complex challenge: the group had to figure out how to get each member to the opposite side of a giant rope web without touching the rope or, in most cases, using an opening more than once. The backward drop was the first step toward being lifted, and it required one to have at least a modicum of faith in the team. The exercise was tricky, odd, and … fun. Throughout the course, similar scenes requiring varying levels of cooperation, communication, and humor were playing out: one group was trying to balance on a wood seesaw, and another was trying to cram themselves onto a 2-by-2-foot platform at the same time. “OK, everyone get as sideways as you can!” a student in the latter group called out as they stepped forward. They managed to hold their spots to the count of nine. Another group was lined up on a log, trying to rearrange themselves in height order without falling off. “I’m perfectly comfortable with this because I salsa dance,” one student told her team. A moment later, when she stumbled, a teammate caught her and the group was able to continue. “We’re at the end!” the woman cheered when she finally arrived at the perfect spot for her 5-foot-2 ½-inch height. At the web, Cohen’s group was determined, debriefing after failed attempts but always rebounding from mistakes. When it was Josephine Oshiafi’s turn, the group was ready for a win. “I trust you guys,” she said, falling back until her pink shoelaces were even with her head. The group passed her over the top of the web, avoiding the openings completely, and deposited her carefully on the other side. She smiled tentatively, and then the group broke into cheers. “I volunteered to be lifted because at that point I was starting to trust my group members, and thought, ‘Let me do this and see if it inspires other people to keep moving,’ and it did,” Oshiafi, ’17, said. Later, when Cohen, Oshiafi, and other students reflected on the experience, these were some of things they’d remember: there are multiple ways to solve a problem, a strong team requires different types of people and contributions, and laughter brings people together. They also learned what they liked about each other. This wasn’t a small thing. Over the course of the first quarter, the bonds that began on logs and under ropes deepened, and this underscored a critical—but sometimes easily dismissed—concept: likeability matters. The likeability lesson, and the importance of personal warmth versus competence, was one that managed to be both obvious and counterintuitive. On one hand, many of the students had entered law school with a default strategy that relied heavily on the competence that had landed them here in the first place. They were used to distinguishing themselves through excellence and hard work. But, on the other hand, in the upper echelon of high achievers — the world that students of the Law School inhabit — excellence isn’t, on its own, much of a differentiator. To illustrate this, Kapnick’s facilitators shared a cluster chart of LSAT scores and GPAs that demonstrated how hard it can be to distinguish one high achiever from another; elite law students were, for the most part, one big, barely decipherable blob at the top of the chart. Their message: clients and employers will assume that a Chicago graduate is smart; that part’s a given. What they really want is an intellect who also can create relationships and work well with others. They want someone that people like. The Hall cohort collaborates on the “spiderweb” task at the retreat. The group must pass each team member through the web withouttouching it, and each opening must be used once and only once. These realizations signaled a growing shift among students who had been through Kapnick: instead of tweaking their behavior and leaving it at that, students were incorporating the lessons into their thinking about relationships, careers, and what it means to be a successful lawyer. For instance, Eric Lewin, ’17, learned to think about the effectiveness of feedback and to focus on responding to and learning from others. “You might think you’re being helpful, but it is important to recognize how other people are reacting to you,” he said. Other facilitators described similar experiences: a deeper confidence, visible professionalism, a greater ability to contribute effectively to discussions. This is the interpersonal polish that law firm and corporate leaders had identified as the missing piece in many young lawyers; it is the gap Kapnick was established to bridge. “I think the value and the impact of this program will continue to grow as the students apply their insights during law school, then graduate and realize they’re approaching meetings with clients and colleagues in a different way, and with a different mindset,” said Kapnick planner Terri Brady, the Senior Leadership Development Coach at Booth and a former practicing lawyer. Once they have graduated, the demands of the legal marketplace will encourage more growth, and the dominos will continue to tumble. Still, Kapnick was a bit of a trust fall for the Law School. Schill and others were skeptical at first, and they wondered whether “soft skills” had a place in a law school known for its deep intellect and demanding academics. But it had also become increasingly clear in conversations with alumni that this was an idea whose time had come. Their message was clear: even the brightest students can’t afford to be interpersonally underequipped. Although some students clearly wished for a formula — and a few even balked at the it’s-up-to-you message — the absence of clear, uniform instructions was intentional. The Law School had a strong foundation on which to build Kapnick. It already had experience with an existing Law School framework, the Keystone Professionalism and Leadership Program—a series of practical talks, trainings, and workshops that started in 2011 and has seen increased attendance since Kapnick launched. In addition, every part of Kapnick is deliberate and rooted in Booth’s years of experience with LEAD, as well as research from a variety of realms: business, psychology, economics, and sociology. Some of these studies are presented directly to students as part of the classroom work, but much of it remains in the background. It is studied by the Law School’s twelve Schiff Hardin facilitators and their counterparts from Booth and used by the planners to inform the order, structure, and content of the lessons and exercises. Despite the high level of preparation, experience, and research, everyone was prepared for the uncertainty that comes with any start-up initiative—a bumpy rollout, perhaps, or backlash from skeptics who would fail to see the real-world significance and assume that the program was feel-good fluff. And, sure enough, many of the students said they were initially cautious; some even pushed back in group discussions, which is exactly what the planners and facilitators had expected from students preparing for a career that values skepticism. Throughout the entire program, facilitators acted as close observers, providing frequent and individualized feedback designed to guide rather than conclude. Several students said that while it wasn’t exactly fun to identify weaknesses, they also learned a lot about how some of those same traits could be, and often were,channeled in highly productive ways. “I learned that sometimes I dominate conversations, but I also learned that I’m good at supporting people who might not be so vocal,” Rossman said. This was a common theme in Kapnick: one size rarely fits all. There are core qualities that matter, but there are different, equally valid, ways to express many of them. When she said this, she was getting ready to hand back the results of the Hogan Personality Inventory, which measures traits along seven scales — response style, assertion, sociability, interpersonal sensitivity, prudence, inquisitiveness, and learning approach. She wanted to be clear: there was no “winning” formula. For instance, someone who scored on the far right of the assertion scale might be energetic, competitive, self-assured, and willing to take initiative — but might also be overly dominant or a poor listener. Someone on the far right of the interpersonal sensitivity scale might be friendly, engaging, and cooperative — but be thin-skinned and have difficulty handling conflict. Cohen had always assumed that his default was to let others take charge. A thinker and observer by nature, he noticed that his teammates also had default settings: in every challenge, it was the same people giving the orders. At one point, he even commented to a teammate that he found it thought-provoking: the leaders were always leaders, the followers were always followers. But then his team took on a challenge that involved traversing an area by walking entirely on heavy beams that needed to be lifted and repositioned as they moved along — a task that required strategy, coordination, and leadership. As the challenge unfolded, Cohen found himself stepping outside his comfort zone in ways that surprised him. Ways that felt good. Even when the facilitators told him he couldn’t talk, Cohen used eye contact and gestures to communicate with his teammates; it all came so … naturally. In the back of his mind, he worried slightly that he might be “pushing other people out” by stepping up, but nobody else gave any indication that they resented his role. This was the type of experience Kapnick’s planners had hoped, and expected, to see early on — a step that would trigger other steps and gradually lead students to a level of interpersonal development they otherwise might not have seen until midcareer. For Cohen and his classmates, the full effect of the Kapnick Initiative will be most evident in a few years — perhaps when they’re new lawyers, taking on leadership positions earlier, or working their warm connections to accomplish a goal, or finding that they rally the support of a team more easily than other new hires.